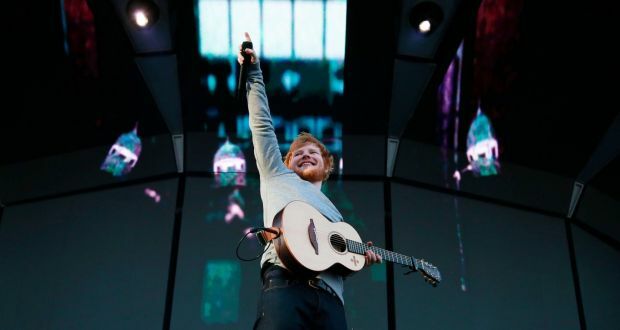 Dublin’s Phoenix Park played host to the last stop of Ed Sheeran’s sold-out Irish tour, as over 50,000 fans filled the sun-dappled field, for the first of three nights. Stewards in high-viz vests kept everything – drinks, bathroom queues, and the procession into the Phoenix Park – moving smoothly. The walk, however well guided, proved a bit frustrating for Emily Innes from Lancashire, visiting Dublin for the weekend: “If I’d known about the walk, I’d have gone to see him in Manchester next week,” she joked. The Park could have easily been mistaken for any major European festival, as the fine weather and relaxed atmosphere both lent themselves well to the music of Sheeran and supporting acts Anne-Marie (who from fan reaction alone could soon be selling out Phoenix Park herself), Jamie Lawson and traditional Irish music group Beoga. Fans were well kitted out, in the official “Divide World Tour” merchandise, or the equivalent sold in Penneys this week, with some wearing facepaint and temporary (presumably) blue dye in their hair, an ode to the colour scheme of the “÷” album. Some reluctant parents accompanied younger children, and more enthusiastic parents accompanied less-than-thrilled teens, while couples young and old made up much of the rest of the packed venue. Throughout the concert children sat on parents’ shoulders, energetically waving their hands in the air. Sheeran, having played six shows on Irish soil in the past two weeks, kicked off his first night in the Capital with his nostalgic pop anthem Castle on the Hill. Skipping the county jersey that he had donned in Cork and Galway, after the first song he commented “nippy innit?” before putting on what can only be described as a lovely geansaí. Commanding the stage and the crowd with nothing more than a guitar and a loop pedal, Sheeran captivated the audience from the first song to the last. While, unlike other artists, he is alone while performing, an extensive team of roadies and technical professionals help clear and reset the stage between supporting acts, and assist Sheeran with guitar changes throughout the show. Moving easily from pop and club favourites to powerful ballads, Sheeran’s set comprised a mix of songs from his mathematically themed trilogy of albums: “+”, “×” and “÷”. Between songs Sheeran engaged the crowd in easygoing conversation, announcing that all musicians agree “that the best crowds come from Ireland”, and urging the crowd to “act like weirdos and lose your voices”. He later appealed to the two per cent of all audiences who decline to participate: the “boyfriends who don’t really want to be here”, and the “superdads”, asking them to raise their hands for the song Bloodstream. During the hit Galway Girl, preceded by a brief rendition of Steve Earle’s song of the same name and accompanied by Beoga, there was a notable division in the crowd, as the not-so-silent minority scoffed at the paddywhackery of it all, while the even-less-silent majority embraced it with open arms, while for Thinking Out Loud, couples throughout the Park slow-danced to the love song, even those couples that appeared to have met for the first time earlier that evening. The evening closed with encore performances of Shape of You and You Need Me Man I Don’t Need You, with Sheeran ditching the lovely geansaí in favour of an Irish soccer jersey. 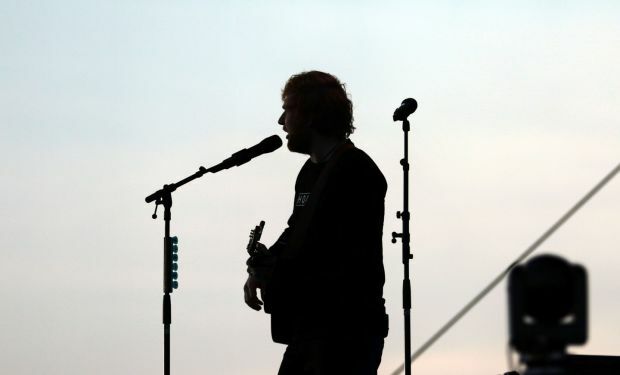 By the end of this week an estimated 320,000 people from around the country will have seen Ed Sheeran perform live. From the delighted screams of hordes of teenage girls, and polite smiles from so-called “superdads”, this Irish tour won’t be his last.